The London Transport Museum on Covent Garden Piazza (WC2) illustrates well the complexity of the capital’s transport infrastructure. While the horse-drawn trams and motorised buses are interesting, it’s the material relating to the London Underground that really fascinates. Pride of place goes to a wooden railway carriage used on the Metropolitan line between Paddington and Farringdon, the world’s first underground passenger railway, which opened in 1863. Since then the Tube has expanded dramatically and helped transform London from a congested Victorian city into the massive conurbation it is today. An intriguing facet of the Tube is its ghost stations of which there are more than 40. While some closed due to lack of customers others were abandoned when rival companies merged or else were reworked to increase capacity. A handful of them are located conveniently on the Piccadilly line, which opened in 1906, and it makes for quite an adventure finding them. First stop is Brompton Road (SW3), which closed in 1934 because of its proximity to the busier stations at South Kensington and Knightsbridge. As early as 1909 some services were already passing through without stopping. During the Second World War the station served as the Royal Artillery’s anti-aircraft control centre for London. Although the platforms are no longer visible from passing trains, part of the façade still survives on Cottage Place, with its distinctive arches and maroon tiling designed by architect Leslie Green (1875–1908). Next stop is the former ticket hall at Hyde Park Corner (SW7), which closed in 1932 when it was replaced by a new sub-surface ticket hall with the same name and its escalators replaced by lifts. At street level the redundant Leslie Green façade is now part of a hotel. Like Brompton Road, Down Street (W1) was another station that proved unpopular, this time because of its proximity to Hyde Park Corner and Dover Street (today Green Park). It too closed in 1932 and again a Leslie Green façade survives above ground. Below ground a change in tunnel surface from cast iron segments to brickwork on the right-hand side denotes where the platforms have been walled off. Behind them was an air raid shelter used in 1940 by Winston Churchill before his Cabinet War Rooms were ready. The next station, Dover Street, was rendered obsolete when escalators and a new sub-surface ticket hall were installed in 1933, at which time the station was renamed Green Park. The most atmospheric ghost station on the Piccadilly line is undoubtedly Aldwych (WC2) at the corner of the Strand and Surrey Street. Originally intended to be the southern terminus for one of the companies that merged to form the Piccadilly line, Aldwych instead became the terminus of a short branch line to serve occupants of the newly-built Aldwych crescent. Opening as Strand station in 1907 (the station façade still bears this name) it provided a shuttle service up to Holborn but by 1918 had been renamed and its service curtailed since it was invariably quicker to walk up to Holborn than wait for the train. During the Second World War it provided shelter for 1500 people together with the British Museum’s Elgin Marbles. 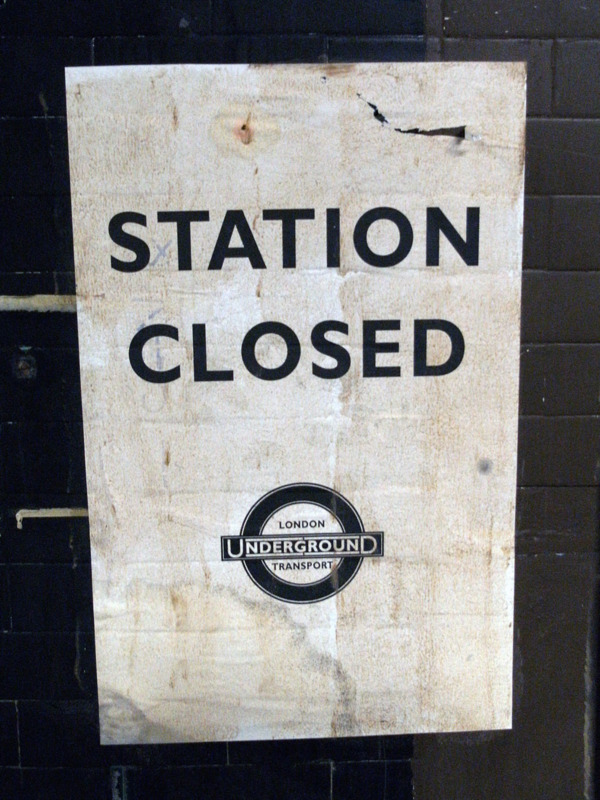 The station closed completely in 1994 after the cost of replacing its antiquated lifts was deemed uneconomic. Since then the mothballed station, with its old-fashioned ticket office, wood-panelled lifts, original tiling and peeling posters, has proved a popular film location. London once had three other underground railways. Of the London Pneumatic Despatch Railway, which carried light freight out of Euston Station between 1863 and 1874, only a solitary vehicle survives in the collection of the Museum of London at 150 London Wall (EC2). Of London’s tram network, which criss-crossed the city until the early 1950s, the abandoned Kingsway tunnel of 1906 remains, with entrances at the bottom end of Southampton Row (WC2) and beneath Waterloo Bridge. Nothing is currently visible of the driverless narrow gauge Mail Rail that from 1927 to 2003 transported millions of letters daily for the Post Office between Paddington and Whitechapel. Plans are afoot, however, to open parts of the mothballed system to visitors. This article is adapted from Duncan JD Smith’s new book Only in London: A Guide to Unique Locations, Hidden Corners and Unusual Objects, published by The Urban Explorer. Existing titles in the “Only In” series cover Berlin, Budapest, Cologne, Hamburg, Munich, Paris, Prague, Vienna and Zurich. Find out more at onlyinguides.com and duncanjdsmith.com.